Last Sunday was a great race for the “Gas Rigs Race”. 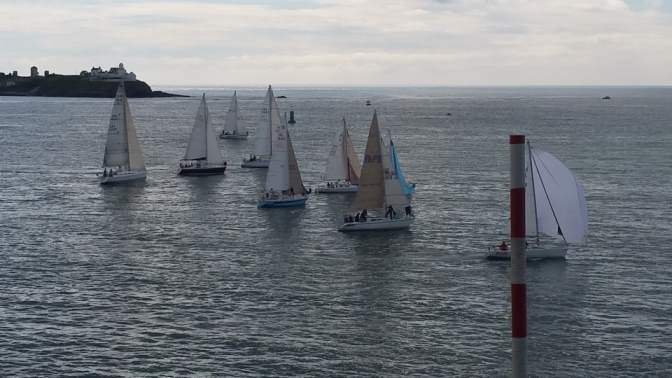 This race dates back to the 80s when we actually set off on a Friday night and raced around a laid buoy or acchored vessel just north of the Gas Rigs and then down to the ‘Pollock’ or ‘The Smiths’. It was long race. Over the years it has been reduced in length. I wonder why? It was always a good tough outing. This year was an all-in start at Weavers in light fickle air and a flood tide proved difficult for most. A fetch and then beat to Cork Buoy. Then a long 10 miler to The Smiths Buoy off Ballycotton with a rolly sea off the starboard aft beam. The breeze increased to about 14knts allowing Spinnakers to be flown for the long run down. The beat back to the finish proved long and hard with the wind against tide (now ebbing) making an awkward sea condition. Well done to Dave Lane and Sinead Enright in YouGottaWanna for a great win. Conor Phelan and Jump Juice were crowned IRC National Champions (Class 0) last weekend at the ICRA Nationals in Howth. Well done Conor and Crew. Testing conditions for the 80 strong fleet with light winds and rain. 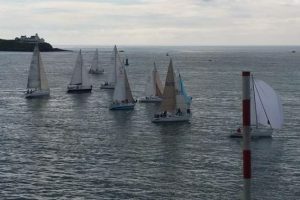 We wish the Watermans well in their trip to the south coast of England as they take part in the ‘Round the Island’ race. Best of luck lads.